Low voter turnout is a huge problem; in many countries voters have been showing up at polls in very low numbers, especially when it comes to local elections and primaries. Many people, especially connected young people, wonder why they can't just vote online. There are many potential advantages to Internet voting; it would make election costs lower and be more convenient for voters. But would more people vote? The theory of implementing online voting, and every citizen engaging fully with elections is utopia; the reality may not be remotely close to that vision. 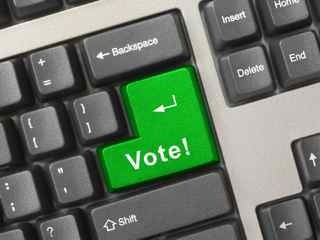 Some critics of Internet voting think potential online voting systems will trivialize the importance of this crucial action. Tradition and symbolism are involved in going to the polling places, marking ballots and placing them in the ballot box. Critics worry that Internet voting would turn elections into online popularity contests at the level of Dancing with the Stars. One nation leading the way in the adoption of Internet voting is Estonia. It has had Internet voting since 2005; however experts note that no positive effect on electoral turnout has been proven in Estonia or any other Internet voting so far. This seems to show that voters are still quite skeptical of this option. While there are ample motivations to implement Internet voting, reasons to hesitate at this point are even stronger. There are many concerns that need be resolved before Internet voting will go mainstream and be thoroughly embraced by the populace. The biggest fear is hacking and manipulation of the vote counts. Other concerns are the possibilities of fraudulent votes and even vote buying. A pilot Internet voting project in Washington, DC in 2010 was the target of an epic hacking by a University of Michigan professor and two teams of students. Within 36 hours, they attacked a vulnerability in the system and took over control of the votes. Even more troubling, the hacking went unnoticed until they revealed themselves by playing the UM fight song when a ballot was cast. The hacker extraordinaire, Alex Halderman, said that he can't imagine any current system that would be totally secure from hackers. This experience clearly shows that we are not ready for mainstream Internet voting, and that most voters would surely be skeptical of Internet voting at this point as well. Until the problems are resolved, no increase in voter turnout can be expected by implementing Internet voting. Resolutions to these problems will need to be found. Safety and transparency in the voting process are vital, so answering the important questions about how to ensure the reliability of the system are crucial.